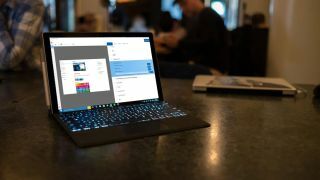 Despite the rollout of Windows 10’s October 2018 Update resuming last week – following the resolution of some major problems – it seems that Intel drivers are still causing issues with the upgrade, with Microsoft now blocking the update from some PCs thanks to a fresh bugbear. Microsoft has previously fixed problems with bugs in Intel drivers (indeed one remedy was issued last month), but it seems that the gremlins persist, as a new post on the company’s support forum makes clear. In reply to a user complaining about no longer getting sound from the monitor connected to their PC after upgrading to the October 2018 Update, a Microsoft moderator observes that Intel ‘inadvertently’ released versions of its display driver which “accidentally turned on unsupported features in Windows”. So currently, you shouldn’t be able to install the update on an affected PC (i.e. it should be blocked). However, to be safe, if you want to double-check the version of your Intel display drivers, you can do so quite easily. Simply head to Device Manager (just type that into the search/Cortana box, next to the Start button), then click on Display Adapters, right click on Intel HD Graphics, select Properties, and finally click the Driver tab, where the driver version number is listed. If it does happen to be one of the above mentioned versions, obviously you don’t want to proceed with the installation of the October 2018 Update (although you should be blocked from doing so anyway, if Microsoft has done its job policing the rollout). If you’ve run into any trouble with the latest update for Windows 10, be sure to check out our guide on how to fix Windows 10 October 2018 Update problems. Note that another issue emerged recently which pertains to those who still use Windows Media Player.